Rickety Mine is a medium-sized mine east of Cheydinhal containing bandits. It contains two zones: Rickety Mine and Rickety Mine Bottom Section. 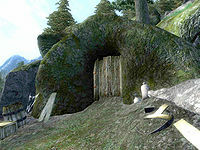 The map marker can be added by talking with Borba gra-Uzgash in Cheydinhal. 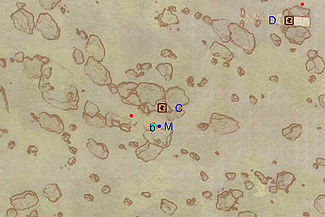 This location's map marker (M on map) is named Rickety Mine (editor name RicketyMineMapMarker). The entrance door is N of the marker, 20 feet away. This zone is relatively straightforward. The first room you'll see when entering contains one enemy and a minor loot chest, with the possibility of a second enemy. When advancing through the wooden door, you will arrive in a C-shaped area. This area holds at least three enemies. 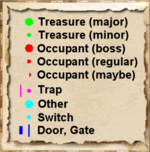 There are also a minor loot chest, two bedrolls at location b, and a torn sack of grain. Delving deeper into this mine leads you past two minor loot chests and at least one enemy. In the last part of this zone, a minor loot chest and a barrel are concealed by some planks. Push these loose planks to get to them. Enter door C to arrive at Rickety Mine Bottom Section. This zone is bit more complicated than the first zone, but not by much. When entering this zone, you can go either left or right. Going left leads you to a lone bandit guarding a minor loot chest. The right path leads you to a room containing one enemy, a food sack, and several bottles of ale, located on a table. Watch out for the Swinging Log trap at E when advancing to the next area. This room has at least one enemy and one minor loot chest. There are two possible paths you can take. Taking the one straight ahead leads you to a dead end with a locked chest guarded by an enemy. The path to the left leads to a big room. This room contains three enemies, including a bandit ringleader at A. The boss-level chest (B) is also located here. After the battle you can sleep in a bedroll, which is very conveniently located at b.